The Kiwanis Club of Lenape Valley ended 2018 with a bang! And we are extremely thankful to all who have donated to our small but mighty club! 150 bags of food collected for our Thanksgiving Food Drive! 84 brand new winter coats purchased for children in the Byram, Hopatcong, Netcong & Stanhope elementary schools! Why: All of the profits for this fundraiser will be used to fund our Kiwanis Club of Lenape Valley’s “Clothe-a-Child” project where we will be providing new winter clothing for local children in need. Because of this wonderful fundraiser our club was able to donate 83 brand new winter coats this past winter. All proceeds from the Pizza Challenge help to fund our Clothe-A-Child Program. With your support our club donates brand new winter coats to children in the Byram, Hopatcong, Netcong and Stanhope elementary schools. We hope to see you Friday, June 2nd at the Gold Nugget Saloon at Wild West City in Byram, NJ! 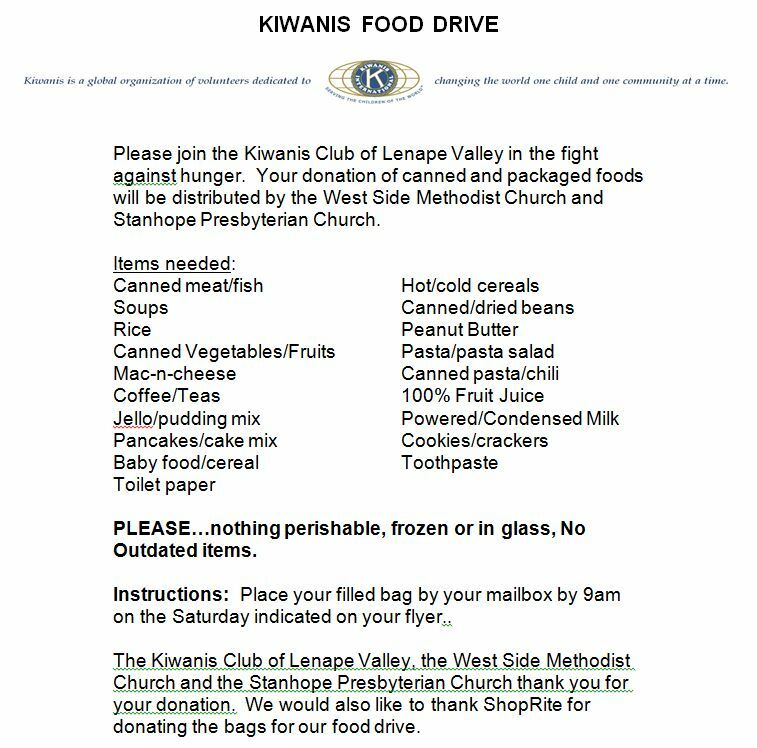 Collect 100 bags of food during our Thanksgiving Food Drive to donate to the food pantries at Westside Methodist Church in Hopatcong and the Stanhope Presbyterian Church. Collect 170 bags of food during our Easter Food Drive to donate to the food pantries at Westside Methodist Church in Hopatcong and the Stanhope Presbyterian Church. THANK YOU LENAPE VALLEY COMMUNITY!! !